As I mentioned a few days ago, I am still recovering from my injury. I believe now that what started out as overtraining before my last race turned into an actual injury during the race. As a result I have had to cut back a lot on my training. This week I was only able to get out for an easy 5 miles and took off the 4 days after that lead up to my race this morning. Friday evening I headed to NYRR headquarters to pick up my race packet. It was my 8th trip there since the end of June and it has become quite familiar. 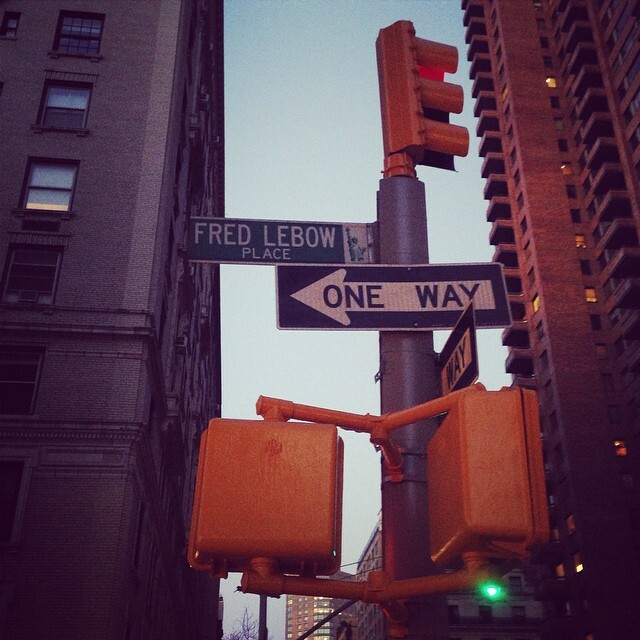 There is something about turning on to Fred Lebow Place and then walking into that old (1902-built, Beaux-Art style) townhouse that Fred Lebow bought in 1981 as the first permanent home to the New York Road Runners. It is starting to feel a little empty since they plan to sell it soon, but there is still something magical about walking through the home base for New York running history. Or I was just feeling extra emotional that evening. Whatever it was, I felt a sense of appreciation and a little bit of sadness that NYRR is moving. I was, however, excited to see what color my bib would be since my last race set me in a new pace group! I’ve been rocking the pink bib (or brown for larger races) since 2011. I am now officially aqua corral! (Which totally matches my running gear better. Bonus!) The night before the race was pretty uneventful. Since I was just going to race to finish and try to take it easy because of my injury, it was very low stress. I had some spaghetti and got bed early after setting out everything I needed on race morning. The morning of the race I got out of bed 10 minutes later than planned. Showered, dressed, ate, grabbed my bag, and was out the door on time. Stopped by the bodega for a coconut water. Got down to the platform on time, but I guess the train was early because I missed it. The next one was in 20 minutes. I felt a little stressed because I needed to drop my bag ahead of the race, but decided to dismiss it. If I had to, I could always run to bag check and the start. I used the time to finish dressing–putting on my arm warmers, Garmin, and SpiBelt–and to pack my drop bag then slide into my backpack for efficiency in dropping. (NYRR security requires you to use a clear bag and you can’t just slide your backpack into the clear bag. Contents have to be visible.) The commute was pretty smooth after finally getting on a train. I always enjoy the build of runners on the train. Where I get on in Brooklyn I rarely see other runners, but as I get in to Manhattan more and more hop on the train. By the time we get to the Museum of Natural History stop, it is a crowd of runners exiting the train and heading into Central Park. It’s a scene that I never tire of. I got to the park at 8:00, dropped my bag at 8:10, used the porta-potties and was heading to the start line by 8:13. Side note: I will never understand why people don’t walk to the furthest porta-potties. Not only are they typically cleaner IMHO, but the lines are always shorter. The closest lines were 10 deep and the furthest was only 2. I was literally in and out in 2 minutes. Anywho, got to the start line and did the standard shifting around as girls flicked their ponytails, people flailed around seemingly unaware of those around them, and people stood uncomfortably close to me even though there was plenty of room for personal space. After about 10 minutes, the race was finally starting. So as I mentioned, my plan was to run super easy so I didn’t aggravate my injury. For the first half mile, I cruised along at 11:45 pace and took in the scenery–the remaining fall leaves, the Obelisk, The Met, The Guggenheim. 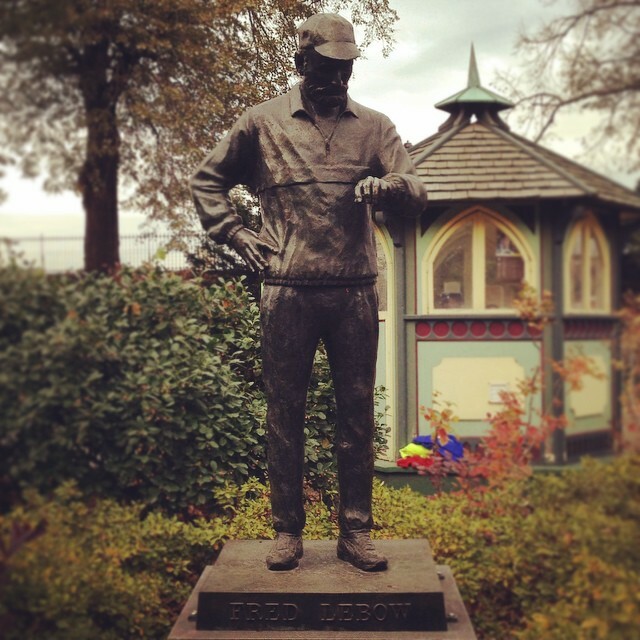 I even stopped to snap a pic of the Fred Lebow statue. It seemed reasonable that I would I keep my pace around 11:30 for the entire race. Then something happened. I’m not sure what it was, but I just found it really difficult to run that easy. I kept looking down at my watch and I was running around a 10:30. My knee felt fine, but I kept telling myself to think about the long term goal. Run easy, play it safe. I still have two marathon qualifiers to run for my guaranteed entry. But it was a losing battle. Every time I looked down, I was running too fast even when I thought I had slowed down. I was getting frustrated. That’s when I decided to run by feel. My Garmin is always a little bit off when I race so I can’t really rely on my lap pace when it ticks off a mile because I am typically not at the mile marker yet. So in the miles after the first, I have to do math to figure it out. I decided that was frustrating, too, so I stopped doing it. I don’t know what happened. Maybe it was the perfect weather. Maybe it was that my knee wasn’t bothering me as much as I thought it was going to. Maybe it was that I can’t stand the thought of just finishing a race. Whatever the reason, miles 2 and 3 were around 10:30 pace. 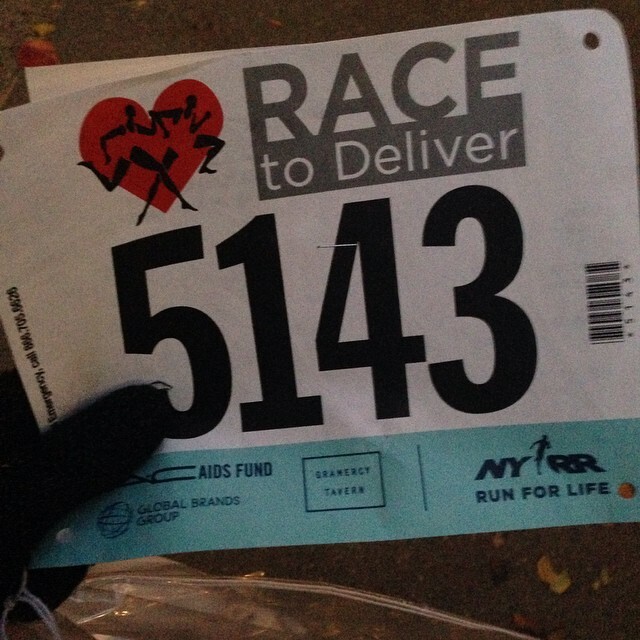 I felt good, the pace felt good, and I wasn’t stressed about pace or injury. Around mile 4 I decided to let myself push a little harder. My knee felt okay and there was only a mile left so I figured why not. When I looked down at my Garmin, I was running a sub 9 minute mile. Now I know I probably shouldn’t have done what I did next, but I just couldn’t help myself. I was so excited about how good I felt and my pace that I raced that last mile. At a half mile to go, I was starting to feel it. (Pushing, not my injury.) When I got to the turn for the last .2 or so miles I was hurting, but the finishing chute was in sight and there was no way I was slowing to trot through that thing. I pushed even harder and finished that last mile at a 6:46 minute mile pace according to my Garmin. Final lap time was 8:45! Race stats. Splits differ because of Garmin drift. After the race I grabbed my bag, changed out of my sweaty shirt and arm warmers, added some layers and then sat for a bit. I was super light headed and hadn’t packed a snack. After about 5 minutes, I headed to the train still with a little bit of race brain. Heading down to the platform I had a funny exchange with some runners who were stretching on the stairs. I got to take the C train which is one of my favorites–they are the oldest still operating–and got to help some very thankful tourists with directions. Came home and made some yummy breakfast, relaxed, stretched, napped, and am feeling pretty good. I am optimistic that my knee may actually be okay, but I never know until the day or two after. 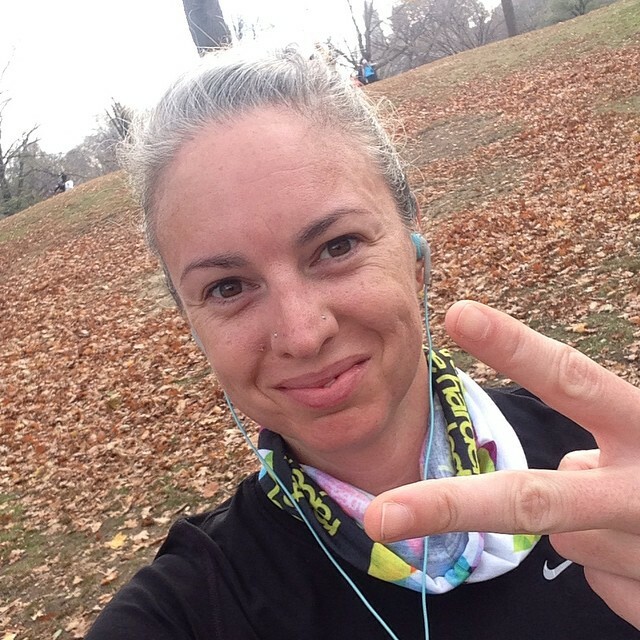 Just two more races now to complete my guaranteed entry to the 2015 NYC Marathon! It’s so crazy that in 20 days this thing I have been working on for 3 months (5 if you count from my first MQ) now will be done. Two more qualifiers to go!